As the dairy industry modernizes, Hispanic immigrant workers play an increasingly important role. Approximately 50% of the dairy workforce in the United States is made up of immigrant workers, largely from Mexico. There are numerous barriers to addressing the health and safety concerns of this workforce including immigration status, language and cultural differences, lack of insurance and limited formal education. The following story highlights an occupational health hazard of working on a farm and stresses the importance of tackling these barriers to keep immigrant works safe. This past winter on a farm in Lincoln County, Minnesota a dairy farmer noticed illness in one of his cows during both the morning and evening milking. The local veterinarian examined her two days later and immediately suspected the cow had rabies because of her neurologic signs and classic abnormal bellow. The cow died the next day, and the veterinarian submitted the head for rabies testing. The results came back positive for rabies and the Minnesota Department of Health (MDH) following up with those involved. Rabies is a fatal neurologic disease caused by a virus that is found in the saliva and is typically passed through a bite. Luckily, there is a series of rabies shots that can be given after an exposure that will prevent a person from developing rabies. Every year MDH tests about 2,000 animals for rabies and approximately 60 test positive. In 2013, nearly one third of these rabid animals were found on farms, which included skunks, horses, cattle, a goat, a cat, and a bat. Like most dairy farms in Minnesota, this farm is family owned and operated; however, they employ an immigrant worker who speaks only Spanish. A total of five people work on the farm and could have been exposed to the cow. Once we spoke to the family it became clear that only the owner and the immigrant worker had significant exposure to saliva while caring for the sick cow, although neither was bitten. 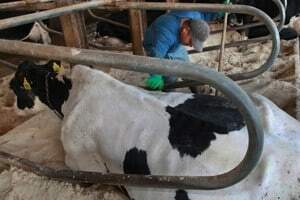 The worker treated the cow with oral fluids through a stomach tube, and both the worker and farm owner helped her when she got tangled in a gate. As a result, MDH encouraged both individuals to get rabies shots. As mentioned previously, one of the individuals exposed to the saliva of the rabid cow was the farm’s immigrant worker. A Spanish-speaking MDH employee helped communicate to the worker the seriousness of a rabies exposure and the importance of rabies shots. Because he does not speak English, was unfamiliar with local resources, and was uninsured, the immigrant worker was concerned about where and how to access treatment. This case underscores the numerous barriers that immigrant workers face in understanding health hazards and accessing care. Language barriers were a problem in communicating information regarding the disease and need for treatment, and then lack of insurance presented a significant barrier to receiving life-saving treatment. Although MDH does not collect information on the cost of rabies shots, it has been anecdotally reported that the costs range anywhere from $3,000 to $10,000 for the series of shots. For a typical immigrant dairy worker the necessary treatment for exposure to the rabies virus could easily cost 10% of his annual income. There are patient assistance programs available from rabies vaccine manufacturers; however, they are generally only available to people who can show documentation of being a U.S. citizen or resident. For undocumented workers these programs are not a feasible option. Unfortunately, follow-up to ensure the immigrant worker in this story was able to receive and pay for the full series of shots has not been possible. This story highlights an additional occupational hazard that can arise on a farm. As the face of the agricultural workforce continues to change and more immigrant, non-English speaking workers are employed on farms, the need to properly train, communicate health hazards, and ensure access to treatment for this workforce will become vital to keeping workers and businesses safe and successful.